Hawaii 2 looms above Lake St. George on a beautiful late summer day. The island, purchased last year by the Chicago-based company behind the party game Cards Against Humanity, has been at the center of a controversy over its use. Chris Martin of Winthrop marked his square foot of Hawaii 2 with a flag and snapped a photo for posterity. "This is Christopia," he said of his square foot. Chris Martin (left) and Pam Seltsam, both of Winthrop, kayaked to Hawaii 2 on Friday to find Martin's square foot of land and have a picnic. He is one of 250,000 people who received licenses to a square foot of the island after buying a holiday mystery pack from Cards Against Humanity. "I think that if people abide by the rules Cards Against Humanity set forth, it's a neat thing," Seltsam said. 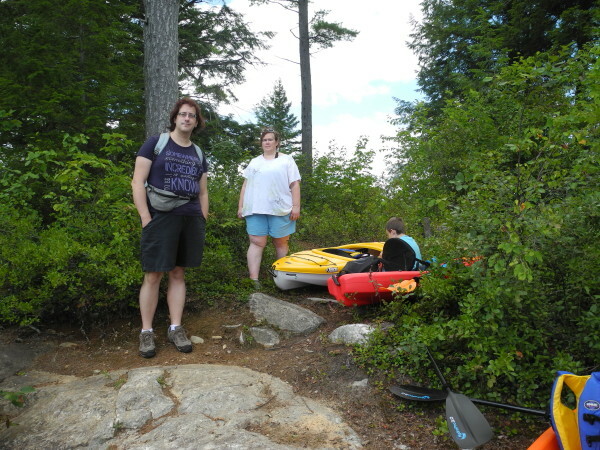 LIBERTY, Maine — Chris Martin and Pam and Ciaran Seltsam of Winthrop pulled up their kayaks last week on the shores of an island in Lake St. George, did a little exploring and then sat under the tall pine trees to eat a picnic lunch. And he has a vested interest, as one of 250,000 folks who can lay claim to a square foot of Hawaii 2, a 6-acre island that last year was purchased and renamed from the more prosaic “Birch Island” by the Chicago-based company that makes Cards Against Humanity. The makers of the popular card game sent a license to a square foot of the island to each purchaser of the Cards Against Humanity holiday mystery pack, including Martin. 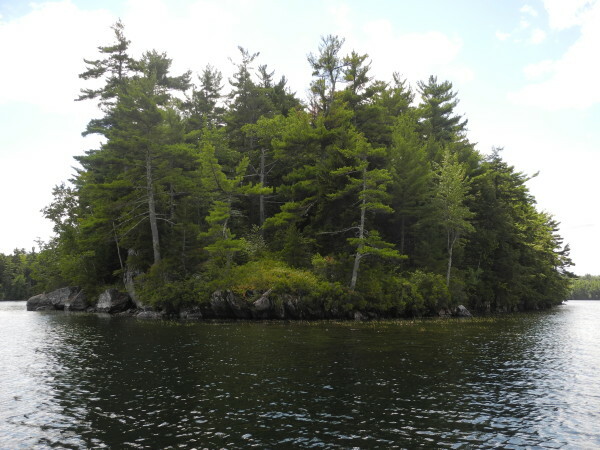 The card game company has described the $190,000 purchase of the island, which they said was located in the middle of nowhere, as a joke and a way to conserve the land. This move was heralded as an awesome prank by players of the card game, which bills itself as a “party game for horrible people,” but as a dangerous precedent by many in the rural Waldo County town of Liberty, which prides itself on the pristine clarity of Lake St. George. Lakefront property owners and others in the tight-knit community have pointed out that the island, in sight of busy Route 3, is not, in fact, located in the middle of nowhere. They’re worried the peace and beauty of their lake might be ruined by the onslaught of unknown numbers of game players. But by August’s end, it was clear such ruination had not happened. The island remained peaceful and free of litter; the feared hordes of rabid Cards Against Humanity fans had not yet crossed over from the mainland to wreak destruction on Hawaii 2. “I think that if people abide by the rules Cards Against Humanity set forth, it’s a neat thing,” Pam Seltsam said. 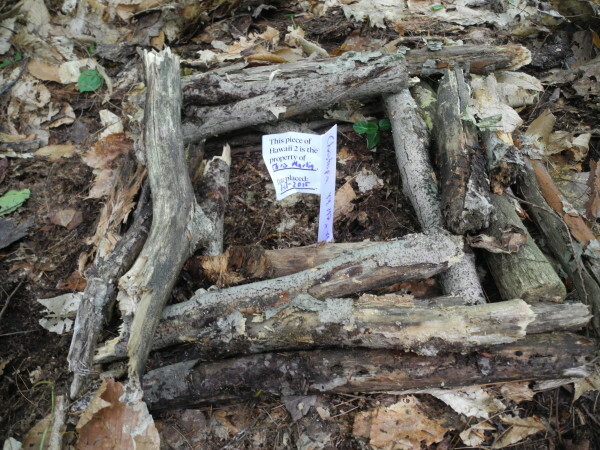 Chris Martin said he enjoyed seeking out his square foot, which he found thanks to the GPS coordinates sent with his mystery package and which he promptly named “Christopia.” He put a flag in the tiny parcel of ground at the foot of a birch tree and snapped a photograph. This spring, anxious town officials didn’t feel they could just rely on that kind of common sense to help protect the lake and their quiet community. Some license holders had crossed to the island over the winter by trespassing on private property, generating complaints from unhappy landowners. Town officials also became aware that the game company had hauled a heavy safe to the island in December and stocked it with 250,000 so-called “sloth cards” and a bottle of good scotch as a reward for game players who could solve a puzzle leading them to it. “Installation of the safe was not easy … it took 16 hours and 18 people to get the safe across the water and installed on the island,” a Cards Against Humanity staffer wrote in February on the game’s Tumblr site. Town officials also saw this spring that yet another game company, this one Owlchemy Labs of Austin, Texas, had found a tree on Hawaii 2 to hide 100 thumb drives with keys, or codes, for a new adventure game. “Someone had to use Hawaii 2 for something, at some point, and this seems like the kind of thing that island was destined for,” opined the online publication gameinformer.com. But the stunts felt like unpermitted commercial uses of the land to Liberty officials, and the town did not want any part of them. In March, Liberty Code Enforcement Officer Donald Harriman sent a strongly worded letter to card game officials telling them to cease all commercial activity there and revoke the 250,000 “licenses” sent out, or else the town could levy fines of as much as $2,500 per day per violation — a maximum of a whopping $625,000,000 per day. He also demanded that the card game people remove the structures they’d brought to the island, including the safe. By April, the safe — by then empty — had been taken off the island. Also, perhaps in response to Harriman’s letter, Hawaii 2 had new user rules. Previously, license-holders had been told they could do anything on their square foot that did not violate federal, state or local laws. Now, they are invited to come to the island, dubbed by the game the “OKest place on earth,” only between the hours of 6 a.m. and 8 p.m. During those hours, the game company says license holders can hike, swim, leaf-peep, birdwatch, “think about dad, squirrel-watch, take photos, propose to lover, have an agonizing moment of self-reflection, look at your phone the entire time.” But they cannot litter, hunt, build a campfire, build anything, “cut, mar or damage nature,” leave a flag behind or leave pet waste. Efforts to contact a representative from the card game company have not been successful. People in Liberty concede that, for many years, the island has served as a de facto public place in Lake St. George. The last owner allowed people to use it to picnic, swim and even camp, though there are no dedicated campsites or toilet facilities, and a well-established fire ring on the island obviously has seen years of use. In fact, on the same day Martin kayaked over to find his square foot, two other people enjoying the blue skies and sunshine of Hawaii 2 had never heard of Cards Against Humanity. The New Jersey couple said they’d stopped at the island every summer since the early 1980s while visiting relatives in Maine. Liberty Selectman Steve Chapin said Monday that as far as he knows, the town is still working out a consent agreement regarding the use of the island, and that the matter remains in the hands of the lawyers. “[We’re jointly trying] to work out between ourselves some land use agreement that’s acceptable to them and us,” he said.